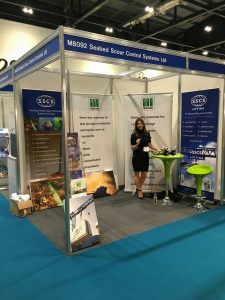 We were at the M&CCE Expo and would like to thank SSCS Seabed Scour Control Systems Ltd for inviting us to join them on their stand! Having the opportunity to meet both old and new clients, Justin and Tina spent two successful days at the Show speaking with Marine and Coastal Civil Engineering professionals. The next Show we are attending will be The Civils Expo on 12 Oct at NEC Birmingham. If you would like to arrange a meeting with either Justin or Tina, please call our office 01493 441747 or email justin@atitanks.co.uk or tina@atitanks.co.uk where we will be happy to arrange a time.